The Northwest Addiction Technology Transfer Center (NWATTC) is offering FREE trainings to Washington State providers, funded by the DSHS Division of Behavioral Health & Recovery. Click on the course title for full description and registration, or view on the NWATTC website. What Training do Addiction Treatment Providers Want? This is the 2nd webinar in a new monthly series from the Northwest Addiction Technology Transfer Center. Presenter K. Michelle Peavy, PhD will examine the concept of patient-centered care in an Opioid Treatment Program (OTP) setting. She will describe a treatment model that leverages patient-centered care components and enhances retention among individuals who struggle with ongoing drug use, and discuss clinical implications of that model. Dr. Peavy is a licensed clinical psychologist in the role of Research and Training Manager at Evergreen Treatment Services (ETS), an OTP located in Seattle, WA. This webinar will use the Zoom platform. Instructions on how to connect will be emailed when you register. Audio will be accessible via computer speakers/headset or telephone. Find out more about this and future NWATTC webinars on the NWATTC Webinars page. On October 18-19, 2017, the Northwest ATTC (NWATTC) held its inaugural event, a 1.5 day training on the Healing of the Canoe curriculum. The training was held in Spokane, WA at Northern Quest, a resort owned and operated by The Kalispel Tribe of Indians. Healing of the Canoe is a life-skills curriculum originally developed by Dr. Dennis Donovan in collaboration with the Suquamish and Port Gamble S'Klallam tribes and colleagues at that University of Washington Alcohol & Drug Abuse Institute (ADAI). The curriculum employs the "Canoe Journey" as a metaphor, providing youth with skills needed to navigate their journey through life without being pulled off course by alcohol or drugs -- with tribal culture, tradition, and values as a compass to guide them, and anchor to ground them. The training event drew 33 participants representing 10 regional tribes, and was facilitated by Dr. Donovan, NWATTC Senior Liaison. 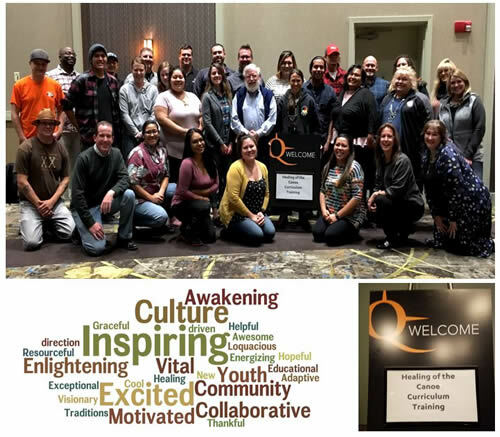 The NWATTC -- a new project of the Alcohol & Drug Abuse Institute / UW -- is excited to sponsor Healing of the Canoe trainings, with plans in the next five years to expand dissemination of this culturally-grounded life skills curriculum throughout SAMHSA Region 10 states of Alaska, Idaho, Oregon, and Washington. The UW Alcohol & Drug Abuse Institute is excited to join the National Addiction Technology Transfer Network as the Northwest ATTC, representing Region 10 states of Alaska, Idaho, Oregon, and Washington. Please visit the new NWATTC website! Read all about changes and new initiatives coming to the ATTC Network for 2017-2012, and much more in the October issue of ATTC Messenger. The University of Washington Alcohol and Drug Abuse Institute (ADAI) was awarded a five-year, $3.87 million grant from the Substance Abuse and Mental Health Services Administration (SAMHSA) to support professional education and development of the addiction workforce in Alaska, Idaho, Oregon, and Washington. Beginning in October 2017, ADAI will serve as the Northwest Addiction Technology Transfer Center (NWATTC), one of 10 regional centers in the national ATTC network established by SAMHSA in 1993. “The healthcare system is in the midst of a transformation, presenting new challenges and opportunities. Our center will seek to support members of the workforce throughout the Northwest region as this transformative process continues to unfold,” said Bryan Hartzler, Ph.D., senior research scientist at ADAI and the grant’s principal investigator who will serve as NWATTC director. The work of the NWATTC will encompass information dissemination, training and technical assistance, and systems consultation for regional treatment and healthcare organizations and their personnel—all intended to increase awareness and implementation of empirically-supported treatment and recovery practices. The new center will draw on expertise in other UW departments as well as working with state agencies, provider organizations, and other stakeholders in each of the states in our region. NWATTC will also collaborate with the other ATTC regional centers and the national office to develop tools and promote strategies and practices to support continuous quality improvement of service delivery. Denna Vandersloot, M.Ed., a behavioral health clinician and trainer for over 20 years will serve as NWATTC co-director. To join the NWATTC email list, please go to http://adai.uw.edu/nwattc/.